I often times find myself writing about sandy beach villas or astonishing ocean views. However, some of my most luxurious vacation memories have existed where there is very little water in sight. A desert vacation can provide wild adventures, luxury hideaways and jaw dropping scenery. Summer has just begun to heat up, reminding me how much I love the warm sunshine. It’s the perfect time to plan that fall or winter getaway. Let’s prepare for that summer sun to fade and start planning a luxury desert vacation! While driving through Page, Arizona, one might think the desert landscape is laid out like a red carpet. When you make the short trek out to Horseshoe Bend, it’s hard to imagine what rests just beyond the cliff. You will immediately understand its worthy name, as the water wraps around a horseshoe shaped canyon. The vibrant red and rust colored rocks are dramatic against the blue-green water that surrounds them. For the most stunning and desolate imagery, arrive around sunrise. Make sure you check out some more tips for visiting this desert hotspot. Surrounded by Navajo land and desert rock formations is one the most luxurious hideaways I have ever experienced. Built right into the rock itself is Amangiri Resort, the perfect base for your luxury desert vacation. It is one of my all-time favorite desert destinations. The best part is it is located just a short ways away from Horseshoe Bend. This makes for the most relaxing and enjoyable sunrise excursion. After you’ve watched the sun rise over Horseshoe Bend, travel the quick 10 miles to Antelope Canyon. Thousands of years of water and wind have molded this beautiful sandstone into what exists today. Don’t forget to book your tour slot in advance. You can only visit these ancient structures through a guided tour as it is positioned on Navajo land. The unique archways, pops of light and wavy sandstone make it a photographer’s sanctuary, yet also an incredible challenge. In fact, one of the most expensive photographs ever sold was taken here in Antelope Canyon. 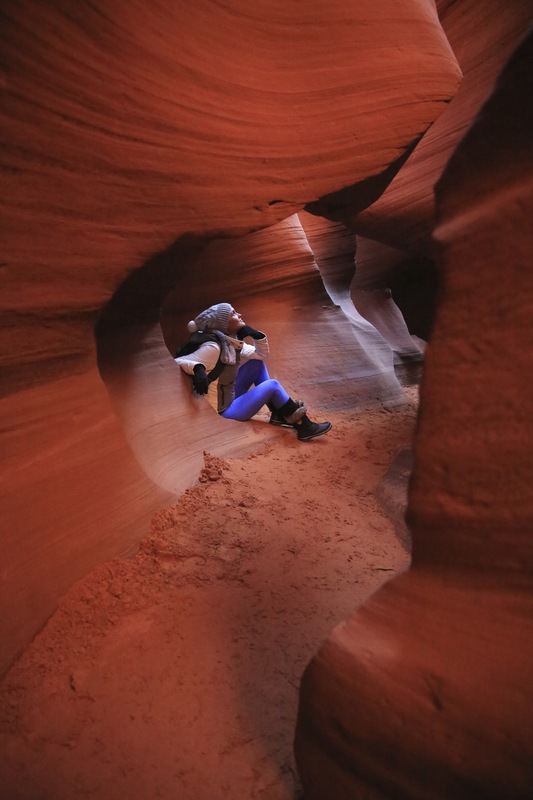 We ventured to Lower Antelope Canyon because it’s less touristy and offered a more relaxing experience. Plus, you can capture some incredible photos without feeling too crowded. It is no surprise that the Grand Canyon is truly grand. There are not many things that could make this experience even more impressive, but a flyover is definitely one of them. Soaring over this vast desert marvel is breathtaking. If this stop is on your desert vacation itinerary, you will want to book a helicopter experience. Not only does it save precious time on the road, but you will be awarded a different perspective only few get the experience. Take this wonderful experience and indulge in a champagne toast during golden hour. There was something magical when I first saw those orange rock walls standing tall against the blue waters of Lake Powell. This is the perfect starting point for your desert vacation. These waters straddle the border of Arizona and Utah. This means that no matter which direction you choose to travel you will uncover some of nature’s richest treasures. This is one of the only desert hotspots where you can find endless water excursions to escape the dry heat! Kayak, boating, swimming and even scuba diving are activities you’ll want to indulge in. I spent a week on a houseboat in Lake Powell and it was loads and loads of fun! Another spot to add to you desert vacation itinerary is the adventure filled destination of Moab, Utah. Arches National Park, Canyonlands and thrilling Colorado River excursions are just a few of the wild adventures this spot holds. Canyonlands National Park is one of my favorite adventure playgrounds. The towering sandstone structures are known as the “island in the sky”. You can even go white water rafting in this desert vacation hotspot! What could make this experience even more memorable is a stay at Sorrel River Ranch. This 240-acre ranch is everything a desert dreamland is made of. Venture by horseback along the visually stunning backdrops or wine and dine in the town’s quaint restaurants. No matter where you stroll, the surrounding scenery will impress at every turn. After all, these images speak for themselves! This desert destination is full of spectacular scenery. Red and white sandstone creations, slot canyons and endless hiking trails are just a handful of items to keep you busy on this adventure-filled vacation. There is nothing more incredible than standing at the bottom (or top) of a 500ft vertical wall of the surrounding canyons. Angel’s landing is a popular and strenuous hike, but worth every bead of sweat. When you reach the top you will have 360-degree views of this gorgeous landscape. Another must, are the connected trails from The Grotto to the Lower Emerald Pools. The name itself is enticing enough and it also presents incredible views of the lower Zion Canyon. There are so many hikes, between the Weeping Rock, The Narrows and Hidden Canyon there won’t be a dull day – or view – for miles. Are you looking for more West Coast vacation destinations? Check out the best spots for a quick weekend getaway.